It is strongly recommended that a termite (a.k.a. white Ants) repellent barrier/exclusion zone be installed as a termite (a.k.a. white Ants) prevention system to all properties. This involves drilling holes every 200mm – 300 mm around the outside perimeter of the property and then injecting approx 400 litres of chemical repellent into the holes. Corks are then inserted to plug the holes and the area is then washed down and cleaned up. This treatment is warranted for a period of 10 years providing that inspections are carried out every year by us (there is a charge for this service). An alternative treatment is to use an attractant chemical like Radiate instead of a repellent. The termites (a.k.a. white Ants)cannot detect the non-repellent termiticide in the soil, so they tunnel into it and pick it up on their bodies they can also pass on the toxicant to other termites (a.k.a. white Ants) before they die and this kills the whole colony. This treatment involves the same amount of work but the costs are higher than using a repellent pesticide due to the high cost of Radiate itself. Although most home owners will have some idea about termites (a.k.a. white Ants), it may be useful to have a little more knowledge about this species even if only to be able to identify what termites look like. There are more than 300 species of termites in Australia, most termite (a.k.a. white Ants) species are grass and debris feeders and are not pests of buildings, termites (a.k.a. white Ants) in forested areas of Australia are considered of value because they reduce fallen branches and trees to organic matter, enabling the return of minerals to the soil. They also play an important role in the food chain of birds, lizards, echidnas, spiders and other predatory insects. Around six termite (a.k.a. white Ants) species are considered to be major pests of buildings and these are all of the subterranean type. Termites are primitive insects belonging to the Isoptera order. They live in colonies that are highly organised. Within the colony are several castes each of which have a specific role, but they all work towards one primary goal which is to try to ensure the survival of the colony. The queen and king are usually the original winged reproductives, known as alates. Alates originate from an existing termite colony and develop temporary wings to allow them to fly out to seek a suitable site to establish a new colony. Initially the queen and king both tend the young (nymphs) in the early stages of the new colony’s formation, but since the queen can often lay a thousand or more eggs in a single day and the normal period of development from hatching through to mature worker or soldier is 2 – 3 months, depending upon food and climatic conditions, the workers quickly take over the role of tending the young nymphs. The termite queen is an egg laying machine she can lay up to 2,000 eggs per day and can live up to 25 years. As may be seen from the picture her body is enormous compared to her offspring. She is tended to by the workers and because of her size she normally has a special, lower, central cell within the nest which is enlarged to accommodate her size and the king is close by. The king’s function is to mate with the queen and stays by her side in the central nursery chamber once the colony is sufficiently established. He is tended to by the worker termites (a.k.a. white Ants) around the clock. The soldier caste is responsible for defending and protecting the colony from enemies (which are mainly ants). They have protruding jaws and larger, armoured heads than the workers, which are often a shade of yellow, orange, brown, or red. The soldiers of some species have snouts instead of jaws in which they squirt a repellent liquid at invading ants. 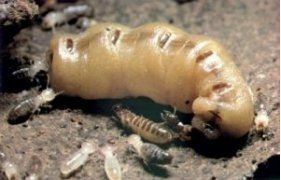 Termite (a.k.a. white Ants) soldiers may be either male or female. 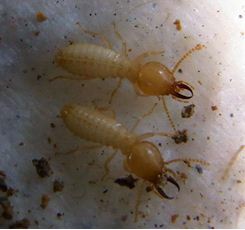 Worker termites (a.k.a. white Ants) perform all the important tasks of gathering food, circulating and maintaining the colony’s pheromones and food among each other via trophallaxis, ten, ding to the eggs and nymphs, taking care of the queen and kingand constructing or repairing the nest, tunnels, galleries, feeding tunnels, and in certain species, fungi gardens. Also, the worker termites (a.k.a. white Ants) are able to perform some supplementary defensive duties when the nest is under attack, as their jaws, so adept at chewing plant matter, are also capable of self defence functions. 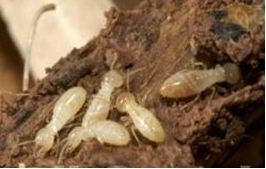 Workers are born blind, and in many subterranean wood eating species, typically pale or white in colour, hence the general concept of termites being “white ants.” In all families with the exception of the Termitidae (one of the biggest families), the worker termites (a.k.a. white Ants) have specialized bacteria in their gullet, which assists the termites (a.k.a. white Ants) in digesting the cellulose found in wood. This bacterium is probably the main reason why a proportion of termites (a.k.a. white Ants) are destructive pests while another proportion of termites (a.k.a. white Ants) are not.